Author John Achor’s popular Arkansas based amateur detective is back! FIVE-SIX, DEADLY MIX, the third Casey Fremont mystery, is now available in print and digital format from Pro Se Productions. Casey Fremont has a knack for solving mysteries… She also has a habit of ending up in danger…and this time both may get her killed! 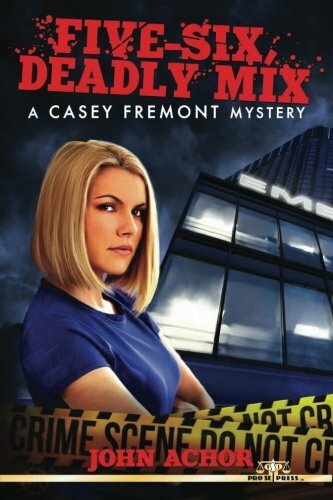 In FIVE-SIX, DEADLY MIX, Casey Fremont lands in the middle of a combined local police/FBI investigation into fraud and theft at a local hospital. Also, Two women have suspiciously fallen to their deaths before Casey reports for work in her undercover role. Once again, Casey brings her roommates, Effie Tremayne and Aaron Kincaid, along to lend a hand. As usual, the rest of Casey’s life is in turmoil as well. Love interests shift and change, someone close to Casey falls ill, and she receives a visit from an uncle she’s not seen in years. This all forces Casey to make decisions that affect her while she edges ever closer to the truth of the hospital case, once more putting that life in deadly peril! FIVE-SIX, DEADLY MIX from Author John Achor! Intrigue and Real life drama collide for Casey once again in this exciting volume of deduction and death! From Pro Se Productions. With an atmospheric cover and logo design by Jeffrey Hayes and logo design and print formatting by Marzia Marina, FIVE-SIX, DEADLY MIX is available now at Amazon at https://www.amazon.com/Five-Six-Deadly-Mix-Fremont-Mystery/dp/1542612063/ref=sr_1_fkmr0_2?ie=UTF8&qid=1485632550&sr=8-2-fkmr0&keywords=five-six+achor+print and Pro Se’s own store at www.prose-press.com for 15.00. The latest Fremont book s is also available as an Ebook, designed and formatted by Marina for only $2.99 for the Kindle at https://www.amazon.com/Five-Six-Deadly-Mix-John-Achor-ebook/dp/B01N9VCGON/ref=sr_1_fkmr0_1?ie=UTF8&qid=1485633004&sr=8-1-fkmr0&keywords=five-six+achor+print and for most digital formats via Smashwords at https://www.smashwords.com/books/view/698793. HERO PULP LIKE NO OTHER STRAIGHT FROM SOVEREIGN CITY! ‘THE ADVENTURES OF DOC DAYE’ DEBUTS AS PRO SE SINGLE SHOT SIGNATURE SERIES! TWO FISTED PULP HERO ACTION NOW ON AUDIO! ‘MONUMENTS OF DOOM’ BY JERRY KOKICH DEBUTS AS AUDIOBOOK!